Using ready-made filo pastry means these are really quick and easy to make. Preheat the oven to 180°C, gas mark 4 and put a large flat baking sheet in to heat up. Spread the nuts out in a separate roasting tin and roast in the oven for 10 minutes until golden. Remove from the oven, sprinkle with sea salt and leave to cool before roughly chopping. Bring a large pan of water to the boil and blanch the asparagus for one minute. Refresh under cold running water then chop into 1cm pieces. Unfold the filo, then cut in half with a sharp knife. Cut each half into 4 squares, to give 48 smaller squares (about 12x12cm in size). Take 4 squares, brush each one with the garlic oil, sprinkle with a little Parmigiano Reggiano and use to line one hole in a 12-hole muffin tin. Repeat with the rest of the filo, garlic oil and Parmigiano Reggiano to make 12 pastry cases. In a small bowl, mix the eggs with the cream, add half the chives and season. 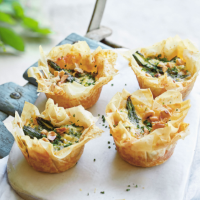 Crumble a little Stilton cheese into each filo pastry case, top with the chopped blanched asparagus, then gently pour over the egg mixture. Place in the tin onto the preheated baking sheet and cook for 20 minutes, until golden. Remove from the oven, carefully lift the tarts out onto the baking sheet and return to the oven for a further 5 minutes to crisp the sides. Scatter over the hazelnuts and remaining chives. Serve warm as a nibble with drinks, or as a starter with seasonal salad leaves. This recipe was first published in Wed May 20 14:24:00 BST 2015.